Hampshire Astronomical Group welcome you! The Hampshire Astronomical Group operating from its Clanfield Observatory base on the borders of the villages of Horndean and Clanfield is reputed to be one of the best equipped amateur observatories in the UK. Situated in the beautiful South Downs National Park we aim to bring the beauty of the night sky to the people of Hampshire and surrounding areas. We hold many outreach events both at the observatory and further afield supported by our many volunteers who are keen to share their knowledge with you. We hold monthly pre-booked open weekend evenings either 2 or 3 nights per month throughout the autumn to spring and in addition, during the summer, we hold solar observing sessions at the observatory. We also accommodate private group visits on selected evenings by prior arrangement – see our school and club visits page. We run astronomy courses and the Duke of Edinburgh Award scheme at the observatory and offer outside speakers to organisations wanting a talk on some aspect of astronomy. We have well nurtured relationships with organisations such as the South Downs Planetarium in Chichester, Winchester Science Centre, South Downs National Park and a number of colleges and Universities in Hampshire. We collaborate closely with the University of Portsmouth Physics Department and have good links with the Institute of Cosmology and Gravitation, also at the University of Portsmouth. We hold monthly public lectures at the Clanfield Memorial Hall in South Lane (details below) often given by eminent speakers where members of the public are welcome to attend. No prior booking is necessary. You can follow the activities of the Hampshire Astronomical Group by regularly visiting this website or follow us on our Facebook page. 8 April – The Moon, Mars, the Pleiades, and the Hyades will all be close together. 9 April – The crescent Moon will be near Aldebaran. 10 April – 23:30 BST – A good time to see the clair obscure effect known as Alexander’s Beaded Rim which can be seen at the rim of crater Alexander. 14 April – evening – Using a telescope look for the Jura Mountains on the Moon and try and see clair obscure effect known as The Jewelled Handle. 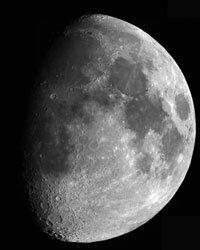 25 April – morning – The Moon will be about 5.8° west of Saturn, and on the 26 April the Moon will be 6.7° east of Saturn. 1 April – Mars is close to the Pleiades. 2 April – Mercury, the Moon and Venus can all be seen low down on the horizon just before sunrise. 4 April – 03:00 to 06:15 BST – Io’s shadow then Io itself transits Jupiter’s disc. 5 April – Minor planet 7 is at opposition and can be found in Corvus near M014 (the Sombrero Galaxy). 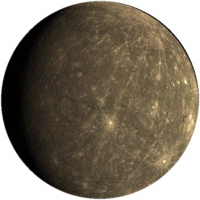 11 April – Mercury reaches greatest western elongation. 16 April – Mercury and Venus will be separated by 4.3°. With a clear eastern horizon, look for them 30 minutes before sunrise. 23 April – 01:00 BST – Ganymede’s shadow transits Jupiter. The planet will be close to the Moon and at 04:40 BST both will be separated by 4.5° and can be seen in the south. 24 April – Minor planet 44 Nysa reaches opposition, and can be seen 1° south of Iota Virginis (Virgo). 30 April – 04:40 BST – Ganymede’s shadow transits Jupiter’s disc. 6 April – Peak of the Kappa-Serpentids meteor shower with a ZHR of 4 meteors an hour. 22 April – Peak of the Lyrid meteor shower with a ZHR of 18 meteors per hour, however there will be a bright Moon. 3 April – Look out for the zodiacal light which appears in the west 90 minutes after sunset. This phenomenon will be visible for 90 minutes. Sun Live Event - See The Sun In All Its Explosive Glory ! Clanfield Observatory offer a rare chance to see the Sun's surface in real time using special Sun Filters. 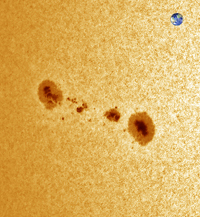 Depending on the weather conditions and the activity on the Sun this is a chance to see Prominences and Sun Spots using Hydrogen Alpha and other special Filters. Should the weather prevent views of the Sun we will give a tour of the observatory and an illustrated talk about the Sun. Entrance is exclusively by pre purchased tickets priced at Adults - £5 each for 16 and under £3 each. (Minimum age 8 years old). For tickets please fill in a booking form on the Sun Live page of the web site. Please note that tickets will need to be paid within one month of the date you book your places. 2019 Asteroids - A Waste of Space? 2019 The Apollo 50th Anniversary Celebration Open Evenings Sold Out! Adult evening lectures on the second Wednesday's of the Month at 4.30pm and 6.30pm, each follow by a short Planetarium Show about the months sky. For more details on the talks and tickets please visit the Winchester Science Centre. Image Credit: © Winchester Science Centre and Planetarium. The South Downs Planetarium is a registered educational charity, which is run by a small team of experienced and dedicated volunteers. The Planetarium operates throughout the year, but is not open every day. Members of the public are welcome to visit the Planetarium at the show times listed on this website. As seats sell out fast, it is essential to book your seat. 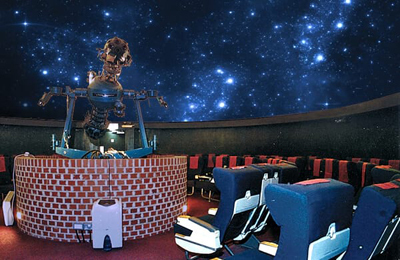 The South Downs Planetarium Trust is a Registered Educational Charity No. 1096869. FutureLearn is a leading social learning platform, enabling digital education through conversation. FutureLearn offers free and paid for online courses and degrees from world-leading UK and international universities as well as courses from companies, centres of research excellence and specialist education providers. FutureLearn partners with over a quarter of the world’s top universities and organisations such as Accenture, Microsoft, the British Council, European Space Agency, Houses of Parliament, Raspberry Pi and Cancer Research UK. FutureLearn provides a range of free online courses from some of the world's leading educators. Courses are created by UK and international universities, as well as cultural institutions and global centres of excellence in a range of subject areas, like the British Council and the European Space Agency. A number of Astronomy courses are listed in the website's Science, Engineering and Maths category. Recent titles have included 'Moons' and 'In the Night Sky: Orion', both from The Open University. The lead educator on the Orion course, Professor Monica Grady, CBE, worked as part of the project team that successfully landed the Philae probe on a comet last November. An added advantage of FutureLearn is its focus on 'social learning', whereby learners from all over the world can have conversations about the topics covered during a course with one another, and with the academics leading the course. FutureLearn adds courses throughout the year and repeats popular titles, so the easiest way to keep up to date is to register on the website. Details on upcoming Astronomy courses will also be listed here.